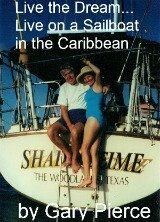 Here are some tips for small places based primarily on our experience in living aboard a sailboat and somewhat on our RV experiences. If you think you live in a small space imagine a 35 foot sailboat with curved walls. If space is at a premium make sure you know what you have and where it is. We made 2 lists, one an alphabetical listing of everything on the boat, and secondly a list of what was in each storage compartment. Both lists were cross referenced. Personalize this list to fit your situation. Know what you have in every drawer, shelf, and attic. For instance, under or behind every cushion was a storage area of some kind. 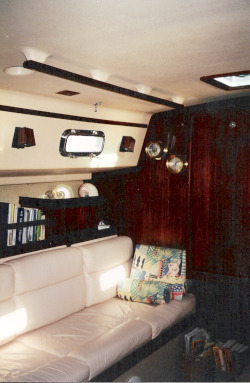 In this picture of our main cabin we had a list of everything behind the cushions you see. The inventory was updated every year in the summer. Everything would be removed and repacked, checking off as we went. This took a full day, but was time well spent. With the exception of spare parts, we had a rule. If we didn't use something in a year we thought of ways to get it off the boat. This is one of the best tips for small places we know. If it is not being used get rid of it. With the assumption made that you have a small space and you are living frugally, here's how...When something, clothes, tools whatever has not been used or worn for a year, it is costing you money. Sell it or donate it to charity. Turn what you are not using into cash to purchase something you need. Go look at your clothes closet right now and look at what you have not worn for a year. What you are not wearing may be equal or greater than what you wear on a regular basis. Have a garage sale and pocket the cash. Get together with your friends and neighbors and consolidate your efforts. It can be a fun social time, and not tie up your whole day. Helps you out and the person who buys what you are selling or giving. It's prudent, it's frugal, it's sensible. You can easily find things when you know where they are. Don't know about you, but my memory isn't very reliable . Pulling out the inventory list and quickly identifying where a item resides saves frustration. This is also great for insurance purposes. If something bad happens having an inventory goes a long way in helping your claim get processed quickly. So make an inventory, it's a great step in getting a small place organized.